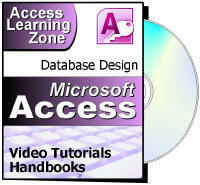 Lesson 1 is only for Access 2010 and 2013 users. Beyond that, users of any Access version after 2003 should be able to follow along fine. This class picks up where Level 6 left off. 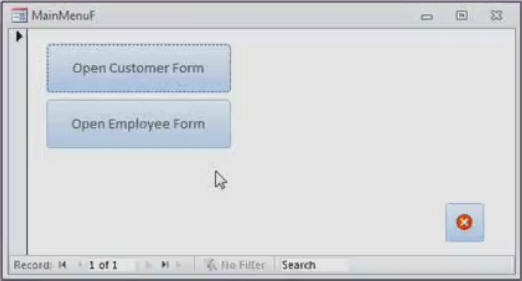 We will begin be learning how to create Navigation Forms, which are a simple way to provide a way to move between the different forms and reports in your database. You will learn about single- and multi-level navigation forms. You will learn how to set a form as your Startup Form so that the database opens up right to it. You will learn how to hide the Navigation Pane so your end-users can't poke around in your forms and reports. You will also learn how to bypass the startup options so you (the developer) can get into your database without restrictions. Navigation Forms have several limitations (which we'll discuss in class). Next, we'll create a Custom Main Menu Form. 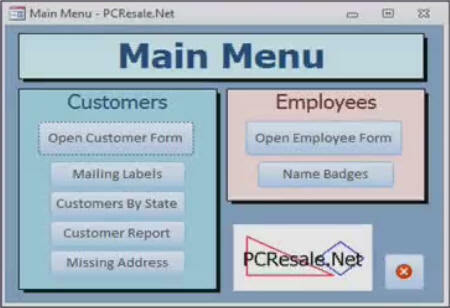 This gives you complete control over the look, feel, and function of the menu interface for your database. You'll learn how to use a Command Button to open a form and show all records. Once we've got the Main Menu Form working, we'll take some time to format it properly. A well-designed menu interface makes your database more efficient. You'll learn about form properties, the form caption, and how to turn off record selectors, navigation buttons, and scroll bars. You'll learn how to use Label objects to create groups for your buttons. You'll learn about the Send to Back command to structure the "stacking" of objects on your form. We'll make buttons to open all of the reports in our database in Print Preview mode. Next we'll build a Sorted Customer List Form. 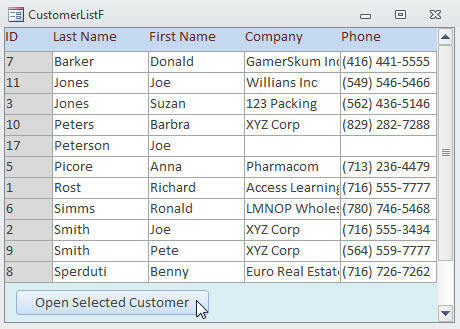 This will be a form that will show us a list of customers, sorted alphabetically by name. We will be able to select a specific customer and then click a button to open that customer's record up directly in the CustomerF form. You'll start by making a sorted customer query, then creating a new blank form. We'll then change the form's Record Source Property to get its values from a query instead of a table. We'll change the form from a Single Form to a Continuous Form so you can see all of the records on one screen. Then we'll activate the Form Header & Footer so you can move the labels to the top, and have room for a button on the bottom. Next we'll create a button to open another form (the CustomerF form) and show a specific record only (the customer that was selected). You'll also learn a bunch of tricks in this lesson, like making a button transparent, setting scrollbars to "vertical only," and preventing users from editing the values on a form using the Allow Edits, Allow Additions, and Allow Deletions properties.